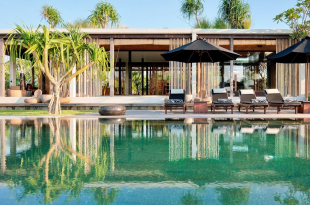 Alila Manggis sits facing the beach in breathtaking location between the sea and Eastern Bali’s sacred mount Agung. Guests will immediately be seduced by the landscape and the sea view though the beach is not the main attraction here. 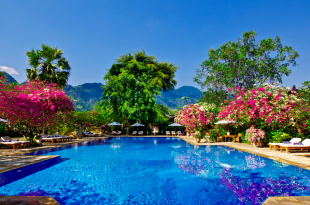 The large square pool comes as the center piece of the resort and invites you at first glance to ease-up and switch on the vacation mode. Cream, chocolate and sand colors of the resort is reminiscent of the nearby traditional village of Tenganan , where the hand-woven textiles and indigenous wood are crafted by a handful of families who retain the skill and legacy of this art. The village is worth a visit to further understand the local art and culture of Bali. Ask your guide questions, you will find some of his answers will deepen your understanding of Balinese rules and traditional socio-cultural behaviors of the lifestyle there. 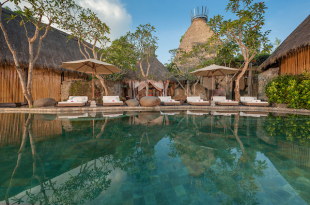 Added to your itinerary, a 30 minute bike ride could take you to the ALiLA Organic Garden for your private yoga class with Kawy, an expressive and serene teacher from the local Gandhi Ashram, a truly unique way to practice yoga in Bali. 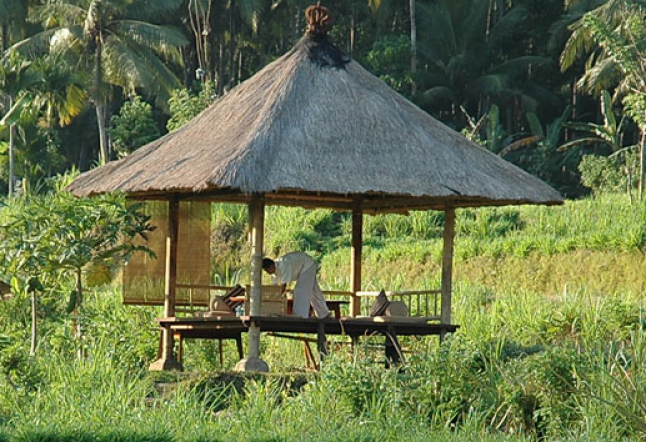 Follow up with a romantic breakfast whilst sitting in the garden’s bale (a Bale is the Balinese word for a pavilion. 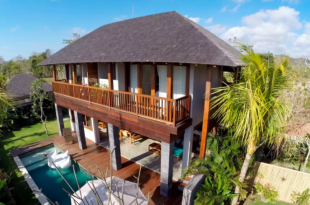 It has four posts, a platform and a roof, and is traditionally used as a retreat from the heat) all of it in the splendid natural surroundings of lush trees and rice fields, giving you a moment to gaze into each others eyes in a lost paradise. 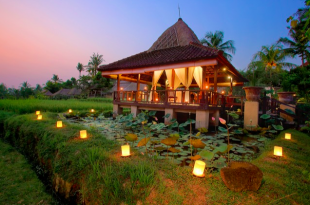 The ALiLA Manggis’ SeaSalt restaurant is hosted in a Balinese pavilion set on a lotus pond and takes its name from a local nearby sea farm. The sound of the crashing waves is the only music played at SeaSalt, so the atmosphere is serene and romantic. 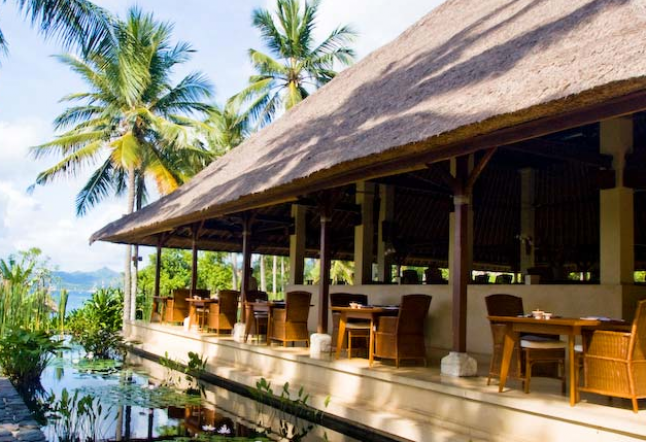 Known for its excellent cuisine, SeaSalt attracts people from outside the resort for breakfast, lunch and dinner however a secluded and peaceful environment for the guests is successfully maintained. An AliLA Boost mocktail (fresh tomatoes, fresh orange juice, black pepper and green pepper) will wake-up your palate and the Vegan Corn Soup with coconut milk and a delicious creamy texture will kick in your appetite. You may enjoy the Arugula Salad from the organic garden with fresh mozzarella, pesto and local tomatoes. A great selection of entrées will satisfy even the most demanding of diners , and the Orog Orog, a traditional dessert made of a mix of black and white rice with local palm sugar and freshly cut mangoes , can be a perfect way to end your dinner. The restaurant crew is extremely helpful with a head chef who would be delighted to get creative with any culinary requirement e.g gluten-free, dairy-free, sugar-free, you name it and you can have it without the taste-free! With an obvious outstanding training yet an unpretentious and authentic delivery, the staff greets you by name and make you feel right at home, attending to your every need without ever being omnipresent. 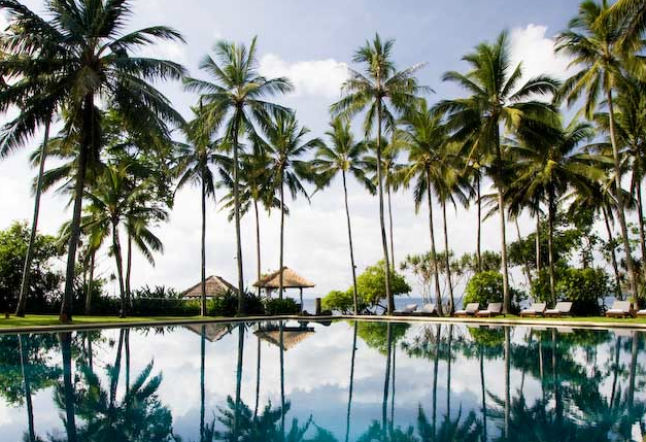 Most of the staff at ALiLA Manggis have been employed for years, and seem to have taken ownership of their work, expressing their pride and gratitude to be part of such a company. 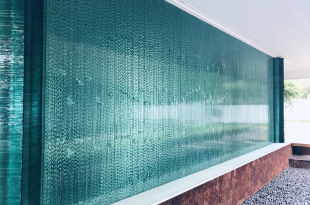 An overall sensation of wellbeing permeates within the entire resort, from the attentive staff, to the delicious food, all whilst being surrounded by calming landscape, all in all creating an authentic experience of wellness and rejuvenation. 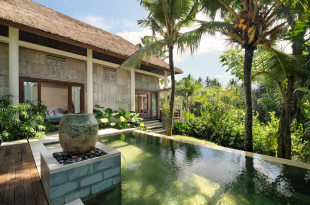 With the cultivation of the nearby organic garden to supply produce for the resort’s restaurant to the mindful corporate culture and the attentive management, the AliLA Manggis resort becomes part of a realm of conscious companies that are looking for ways to give back to their employees and surrounding communities. (Children’s community projects with local villages to enhance awareness on sustainability and eco-friendly behavior are organized monthly known as The Green Bank Project). 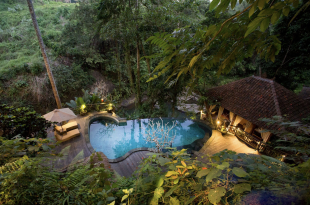 Couples seeking a getaway of pure relaxation, great cuisine, tranquility and beauty while spending their dollars on a company that makes a difference, will find that AliLA Manggis offers a great mix of all, in an atmosphere of peace, serenity and understated luxury. It is our mission to find new and unusual hotels to add to our list of places we would like to return to over and over.